Nicky Low celebrates trophy success with Derry City. Pic by Sportsfile. Nicky Low - the club’s former Player of the Year winner - has confirmed over social media his exit from Derry City. 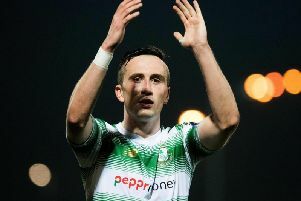 The Scotland-born midfielder took to Facebook with a post confirming “that’s me finished at Derry”, highlighting in the message “a frustrating season on and off the park”. Low has spent two spells on the books with City, winning individual honours as well as playing a role in last month’s EA Sports Cup final triumph. City wrap up the SSE Airtricity League season on Friday away to St Patrick’s Athletic, sitting seventh in the Premier Division on 42 points from 35 games.